Ready for a vicious game of mystical hot potato? Hex Hex XL pits players as rival wizards casting particularly nasty spells at each other until one’s voice echoes loudest. In classic Smirk & Dagger fashion, you’ll have ample opportunity to sacrifice your friends in order to protect your own neck! Getting ready for a game of Hex Hex XL couldn’t be easier. You’ll shuffle a large deck of Hex cards and deal five to each player, leaving the rest stacked between you. You’ll also have a handful of tokens to place in the center of the playing area… but that’s it! If playing with one of the two included variants there is just a little more to do. With the Vexed variant you’ll have an additional deck of 25 Vexed cards to shuffle and place next to the Hex cards. With the Hexen Stix variant you will place a number of Hexen Stix equal to player count minus one in the center of the play area approximately 8 inches apart. There are nine Hex cards used only with the Hexen Stix variant that need to be shuffled into the Hex deck. Finally, there is an additional deck of 16 Hexen Stix cards to shuffle and leave stacked close by. You’ll start Hex Hex XL by determining the opening dealer. This player has no responsibility other than distribution of 5-card hands to each player. The player to the left of the dealer, however, plays an important role – that player is the Caster. The Caster gets to determine who to throw the Hex at first. This isn’t simply the person at the table you like the least, but ideally the person you think has the advantage during the round. This may be an opponent who got to start the round with more than five cards in-hand (possible only through a particular Permanent Effect card), or the person ahead in Voice (Hex Hex XL speak for points). Of course if neither of these is evident it’s probably best to throw it at the person you like the least. The Hex’s recipient will now play a card out of their hand to deflect it to another player. The Hex continues to be passed this way until some unlucky soul lacks the means to move it (either because they’re completely out of cards or because the cards remaining in their hand can’t move the Hex), causing the Hex to go off. This player is Hexed, losing some number of Voice depending on the power of the Hex (it can be enhanced greatly while shooting around the table), while the player who forced the Hex onto them is granted Voice. A number of rounds equal to player count plus one are played this way before a winner is determined. Each round the responsibilities of dealer and Caster rotate clockwise around the table so that everybody will be Caster once. In the final round the player with the least points plays Caster. Most rounds of Hex Hex XL will see the Hex get enhanced greatly – sometimes it becomes a juggernaut that will force a crippling Voice loss on its Hexed, other times it breaks into 3 or 4 Hexes, all shooting frantically around the table ready to burst. Rounds usually end in a different fashion than you’d expect. The two included variants add a few changes to gameplay. When playing the Hexen Stix variant there are nine extra cards in the Hex deck, four of which are titled Grab. When a Grab card is played every player must drop their hand and, well, grab one of the Hexen Stix standing in the middle of the table. But there is one fewer stick than players, so somebody will be left out. And that slow poke will be penalized by having to draw the top card of the Hexen Stix deck. This deck is full of nastiness that you’d do best to avoid… so stay on your toes! The Vexed variant adds a little more party to this party game. When playing with Vexed, players who find themselves on the business end of a Hex won’t only lose voice – they’ll suffer an additional (usually fun) penalty. A card drawn from the Vexed deck typically instructs the effected player to behave differently during the next round – maybe act more enthusiastically, or only use a certain set of words. For a relatively simple party game built around throwing a small cardboard token all over the table, there are a surprising amount of components included in Hex Hex XL, all of high quality. The 200 cards at Hex‘s core have no artwork, but beautiful graphic design makes up for it. All cardboard bits are sturdy if not thick, and contain the same great design. Six glass beads are a little large for the scorecard they rest on, but it’s pretty easy to see through them to your current score. Lastly, the five Hexen Stix are large, full-hand pieces – necessary given their purpose. The rules are very simple, so it’s a snap to learn and teach Hex Hex XL. More difficult will be arbitrating disagreements between new players – it takes some time to fully understand the way certain cards will interact with each other, and it’s sometimes necessary to seek out answers online. This is a “take that” game… but there’s nothing else to do other than deflect the Hex, so it shouldn’t be taken too seriously when you, say, throw it at your defenseless pre-teen. It’s a good way to get a family that doesn’t take games too seriously together for a common activity. Hex Hex XL is a tremendous party game… provided you like getting a little chippy with your friends. Decisions you’ll make to strategically play cards from your hand will be completely undone by counters from your opponents, and even if you manage to expertly detonate that Hex on another player you may find that YOU suffer the point loss. Easy to get into and a quick play time make this a winner for Casual Gamers. Avid Gamers should always have a few party games on hand that can interest even some non-gamers, and Hex Hex XL fits the bill. A light and quick “take that” won’t offer much for Power Gamers. Hex Hex XL does a great job of making you feel like a wizard casting nastiness at your opponents in a pretty novel way – by not beating you over the head with wizard-y stuff. Your cards are your spells… use them as you see fit to smite your enemies. The rules include a caveat where the winner of a game gets to introduce a new rule for the next game. This works perfectly in a party environment – you can play a dozen games and keep stacking additional rules to make things truly ridiculous. The variants are nearly perfectly tested – one of them introduces a dexterity element if that interests your group, while the other can add the silliness of winner-defined rules in the very first game. Depending on what your group wants in its game night, Hex Hex XL can cover a lot of bases. 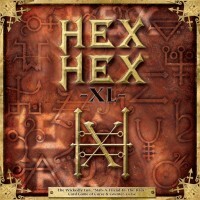 HEX•HEX™ is a fast-playing, stand-alone card game for 3-6 people. Players hurl Hex after Hex around the table, constantly redirecting, deflecting and altering the Hex’s power until finally someone runs out of options and becomes HEXED. In the end, the winner alone will command enough Voice to control the group and lay down the law... creating a new rule for the next game. The new base game, Hex•Hex XL, includes all of Hex•Hex 1.5 as well as the best of Hex•Hex Next – PLUS 2 ALL NEW play variants and bits to go with 'em that add a lot of excitement to game play. The variant Hex•Hex Vexed includes 25 new 'law' cards and 12 new tokens -- and is perfect for a one-game sitting, where you want to see a few classic HEX•HEX ‘Laws’ come into play DURING play. Each Hex cast becomes a specific type of Hex – that delivers a curse upon all the players who become Hexed that hand. The other variant, Hexen Stix, adds a lightning-fast reflex element to game play – a ring of hexagonal shaped obelisks that mete out penalties for those who do not rise to the challenge quickly enough in grabbing them and can reward those who do. Fast and fun. This game is all about non-stop player interaction. Every card you play is an attack or a back-stabbing tactic. A good amount of the rules are right on the cards so there's a small learning curve (one game ought to do it). After that, it is pretty simple to play. Heck, even your non-gamer friends will enjoy it. A single hand lasts from 3-5 minutes. A game from 20-30 minutes. But more often than not, groups play sessions running 3-5 games long as players create new and different ways to be ‘mean’ to each other. (check our list of favorites) It's no strategy game. But if you're looking for a great 'beer & pretzels' style game with a fun mean-streak. This is it. For those who already know and love the game, new and previous fans alike have told us that they couldn't imagine playing the game without the variants now. We think that says it all. What the HEX is HEX HEX? HEX HEX is a curse and counter-curse game of hot potato. Players bounce a hex around a Casting Circle (Fancy Thematic Term Babelfishery: The Table) through card play, deflecting it from themselves onto other players who return the deflection until in the immortal maxim of Popeye the Mojo Man: “That’s all I can deflects – I can’t deflects no more!” Eventually a player cannot pass the hex and it ‘goes off’. Points are scored. Points are lost. A new round begins. HEX HEX is a fast and make-you-furious group dynamic game. Players are given a Score Card to track Voice (or points – starting at 5) and dealt a hand of five cards. An initial caster throws the first hex at a player making them The Intended. The Intended plays a card from their hand, ponging the hex elsewhere creating a new Intended. Rinse and repeat. Cards are rarely drawn during a round, so eventually you find your defenses depleting with potential hexing headed your way. Cards are your friend. The HEX HEX Deck has 150 of them to use and abuse. Basic Deflections: About two-fifths of the deck are basic deflection draws allowing you to turn the hex right, left, or bounce it across the table. The other three-fifths – well that’s where things get a HEX of a lot more interesting. Enhanced Deflections: These still pass the hex, but with a little more spice. To name a few: Boosts can kick the hex up a notch in damage power. Compulsions can force the hex to always be passed a certain way. Twains can split the hex into multi-hex pinballing hoodoo. Oh and then there’s Rot – gently poisoning every player it touches. Counter Hexes: General plan disruptors that can be played out of turn. To name a few: Nulls can cancel cards as they are played. Dismiss can dispel hexes in play. Stun can freeze a player in his tracks and cause a hex to go off prematurely. No one said you had to play nice. Standing Effects: Rarities that can give you a round rule changing bonus. Why not Ban the use of a named card this round or Charm someone against hexing you? Play Only When Hexed: Malicious kept-in-hand insurance policies in case you find yourself with hex all over your face in a given round. Spread the point loss love with Divide and Conquer or drag someone down with you with a lovely bit of Spite. Hexes continue to bounce, boost, multiply and general havoc is created around the Casting Circle until someone is stuck with a hex they can’t deflect and it goes off reducing the voice of the Hexee by one and increasing the Hexor by one in return. (Although that is pretty much never ‘just’ the case.) Multi-hexes keep flying until all go off. (Note: Getting hit by one hex doesn’t take you out of the round. Prepare for the swarm – Oh Defenseless One!) The round ends. Voice is tallied. Hands are discarded and new ones drawn. The sun rises on a new round of curses. Rounds play out in about 3-5 minutes. A game lasts players plus one rounds. Total time for a good bout of HEX Slinging: 20-30 minutes. Player with the most Voice wins the game. Oh – and since they speak loudest and carry a big HEX – they also become The Law allowing them to create a rule for the next game played. A ring of black and tan (Ebon/Bone) wooden sticks minus one player are placed in the center of the table. (We’ve dubbed this – The River) Special HEX cards for this variant are shuffled into the main deck (mostly Grab and a few other one-shots) and a special Hexen Stix deck is placed off to the side. Whenever the Grab card is played – players immediately attempt to grab a stick from The River Stix (you had to have seen that coming) leaving holders as Ebon or Bone and hold-outs as Naughts. The top card of the Hexen Stix deck is turned over usually granting a boon to either the Ebon or Bone players and a grumble worthy penalty to the Naughts. Prepare for knuckle scrapes with this one. HEX HEX Vexed: This variant uses a special off-to-the-side Vexed Deck to introduce ‘Laws’ during the rounds of a standard game. Players who become Hexed in a given round receive an aptly named ‘Hexed’ token which is flipped to ‘Vexed’ come round end. The top card of the Vexed Deck is flipped and Vexed players are subject to a curse as stated on the card throughout the next round. An example (and my personal favorite):BAM – each time a Vexed player plays a card they must do so with a flourish and say ‘BAM!’. If they don’t, they lose two Voice. So who is HEX HEX for? Pretty much anyone who doesn’t suffer from the curse of taking themselves too seriously. It’s a good game choice for some fast and dirty card play. More substantial than Uno. More edgy than Fluxx. It is easy enough to ‘gateway’ as mechanics can get picked up in one practice round. It is popular fare in our backyard during summertime BBQ season. Somewhat locked in at 4-6 players, it makes for a good 30 minute ‘starter’ on group game nights, especially if the ‘main course’ is something you want the gang pre-amped for. Goes nice with a buffet of the competitive – compliments deck builders, worker placements, and general kingmaking well. A shrimp cocktail of tension before an evening of Battlestar Galactica or counting canned food and treachery in the Dead of Winter. I would avoid pairing with tablecloth staining cabernets and quiet cube pushing. As a child I fancied myself quite the hot potato player. While there wasn’t a tremendous amount of strategy or mental acuity involved, I spent a fairly absurd amount of time honing my skills in the art of both the catch and the toss. I had no choice but to value physical prowess over the sharpness of the mind. In time, I worked up to the second rated player in my class (or would have, if such a rating ever existed or had even been discussed in passing.) As self appointed #2, I was ever sucking the proverbial exhaust of one Billy Smith. Smug and pompous as he may have been, the kid could toss (and catch, unfortunately.) I hated him to his core, but I will never deny him that. While I always felt he held the potato a bit too long or made his tosses a bit too leisurely, the fact of his illegal play was never proven in the court of 4th grade public opinion. Sidenote – It was also never proven in a court of law – not for lack of trying on my part – and was how I learned the definition of “frivolous lawsuit” from a rather stern looking, ableit somewhat handsome middle-aged woman in a pants suit. The point being…. if I could just track down Billy Smith, this would be my game of choice for the epic rematch. I would spare all of the other players at the table (assuming he brought friends, as it should come as no surprise that I wouldn’t be providing any) and spend all my Hex tokens on one Billy Smith. Add a Review for "Hex Hex XL"